Liverpool boss Brendan Rodgers admits his team has not been good enough after their Champions League exit. 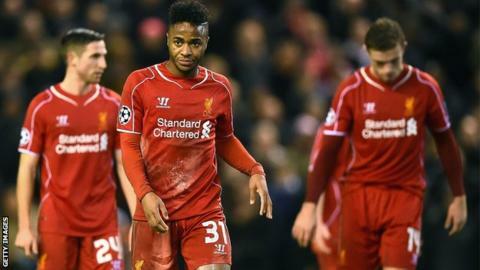 The Reds dropped into the Europa League after drawing 1-1 with Basel at Anfield in a match they needed to win to progress. "We have to be better in our performance level," said Rodgers. "We haven't been good enough over the course of qualification. There is disappointment, but now we have to fight for the rest of the season." Steven Gerrard offered hope he might perform a rescue act similar to his effort against Olympiakos 10 years ago with a brilliant late free-kick against the Swiss. But ultimately Fabian Frei's first-half goal ended Liverpool's hopes. Rodgers, whose side won only one of their six group games, added: "We can't have any excuses. "We had enough games to try and get enough points but the key one was away to Basel, where we were disappointing and lost. "If you deserve to go through you get the points. "We really wanted to qualify but we weren't good enough. "But you have to remember where we have come from. We have come a long way in a short time." Liverpool are ninth in the Premier League table ahead of Sunday's match at Manchester United. Rodgers accepts there will be more scrutiny on him and his players after failing to make the knockout stages of Europe's most prestigious club competition. "When you don't qualify, everyone gets looked at," he said. "Across the board we have been looked at and analysed. For us the solution is simple, we have to be better in our performance level. "The expectation coming into the season was high but it is a different squad and a different group of players." Liverpool had been out of the Champions League for five years before this season's participation and to go out so tamely, and to show so little of the thrilling football that almost took them to the Premier League title last season, will be a huge disappointment. Rodgers was frustrated by the second-half sending off of substitute Lazar Markovic after he raised his hand towards Basel's Behrang Safari. "His fingernail touches his nose," added Rodgers. "This has been a wretched Champions League campaign for Liverpool, with only one win from six games. On that basis there can be no complaints from manager Brendan Rodgers or his players." "The Basel player is the guy that should be sent off for his reaction. "It's a shame as young Lazar was showing real promise and that sending off was a real, real disappointment for us." Liverpool captain Steven Gerrard echoed his manager's candid views as he conceded the Reds did not deserve to advance to the knockout phase. "We have not gone out because of this performance," said the 34-year-old midfielder. "We weren't good enough away to Basel and we let in a silly goal away to Ludogorets.